Another week already?! I'm sure I say it every week, but good gosh I need for time to slow down. I know life will only get busier with all of the holidays coming up before too long, and I'm trying once again not to get anxious about all of the things I'd like to do before this baby boy makes his debut. Lilly went to bed not too long ago and the Baums are doing some cooking tonight (homemade tomato soup for tomorrow night [Dan has already started on it and good gosh it smells delicious] and banana bread for Lilly's lunch tomorrow), so I'll get right to it. 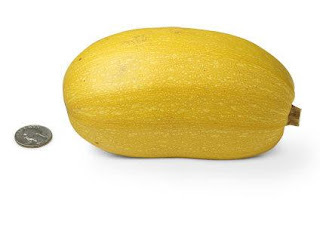 Does anyone else feel like a spaghetti squash looks like it would weigh more than 1 lb? He's starting to look like a real live human baby now: his lips, eyelids and brows are becoming more distinct and his eyes have formed (but there's no color to them yet). He is apparently also developing tiny tooth buds. Neat-o. Weight Gain So Far: By rough estimate aka my home scale, I think I'm now into the double digits at +10 lbs. I'm okay with 10 lbs at 22 weeks, and thankful that it wasn't more this week since we just returned from vacation where I stuffed my face. A lot. Cravings: I have still been killing some Golden Grahams, but I think I might be getting over it. I'm trying my hardest not to think about the fact that candy corn is readily available in all of the stores right now. Before I know it, it will be time for candy cane kisses. YUM. Aversions: Pork. I'm not sure why I haven't thought to mention it before, but I have not been able to stomach even the thought of pork. My poor husband had to sneak out for some BBQ one night last week because he's been wanting some and I couldn't even handle considering it. Symptoms: Same old - tired, peeing a lot and clogged pipes. The ring rash has finally gone away so I tried to wear my rings one day over the weekend but it started to come back so I took them off again. Rats. Movement: For the first time this pregnancy, I've finally felt some really consistent kicking/jabbing/dancing and it is so sweet! I love it. I am pretty sure that baby is still breach (breech? ), because it's all happening in the lllooowwww area of my stomach if you'er picking up what I'm putting down, but obviously I have no way of knowing that for sure other than all of the movement is occurring in almost exactly the same (lllooowww) spot every time. What I Miss: Can't think of a thing! 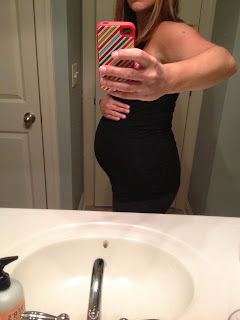 According to the 22-week post from my last pregnancy, Dan was rushing me and I therefore did not have time for a pic, so no comparison photo this time. I'm sure I was equally as huge if not even more whale-like, though. I did notice while skimming that post that I was only up 8.5 lbs at 22 weeks last time around, but I feel like I am carrying very differently this time around and maybe even look a little smaller. Surely during my last pregnancy I was a total liar. What I'm Thankful For: A wonderful long weekend vacay with my family! I did not want to come home, and when I did I felt like I should have taken another PTO day to recover. We had a blast! I'll try to do a post about it this week, but in the meantime you can check out my sister Katy's post to hold you over. So much fun! What I'm Looking Forward To: Fall! Fall weather, fall food, fall clothes (for Lilly of course), pumpkin patch (hopefully with the besties again! ), pumpkin carving, pumpkin beer, Halloween, trick-or-treating. I bribed L into trying on her costume the other night (with candy of course) and almost died of cuteness overload. Can't WAIT for her to wear it in her school costume parade and for trick-or-treating! And also the completion of the mountain house. SO close! I just realized some of those may be repeats from last week, but whatever. Next Doctor Appointment: October 22! That's all for me, folks. Hope everyone's week is off to a great start! Mine has been busy that I'm ready for it to be over already, ha. 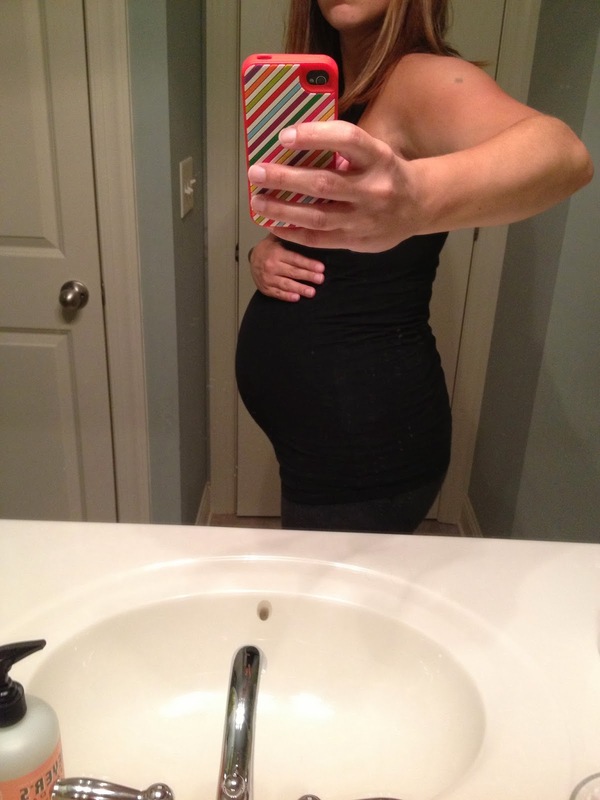 Love your baby bump! I gained weight all over with both girls, so I feel like I never really had a cute little baby bump. I'm not preggers, but I'm totally looking forward to all things fall too!! You are a liar, I have it on good authority (Carney) that you were very cute pregnant. :-) She also told me about Ellie wanting Lilly to go to dance class and I almost died of cuteness overload. Those girls are so sweet together!! !